In February, 2008, the Third Way, which defines itself as a "nonprofit, nonpartisan strategy center for progressives," released a signifi cant policy statement entitled, The Impending Crime Wave. This paper describes the convergence of what the Third Way conceives of as four new and menacing sociological trends, which, together with recent federal disengagement from crime fighting, allegedly threaten a new and devastating wave of crime in America. 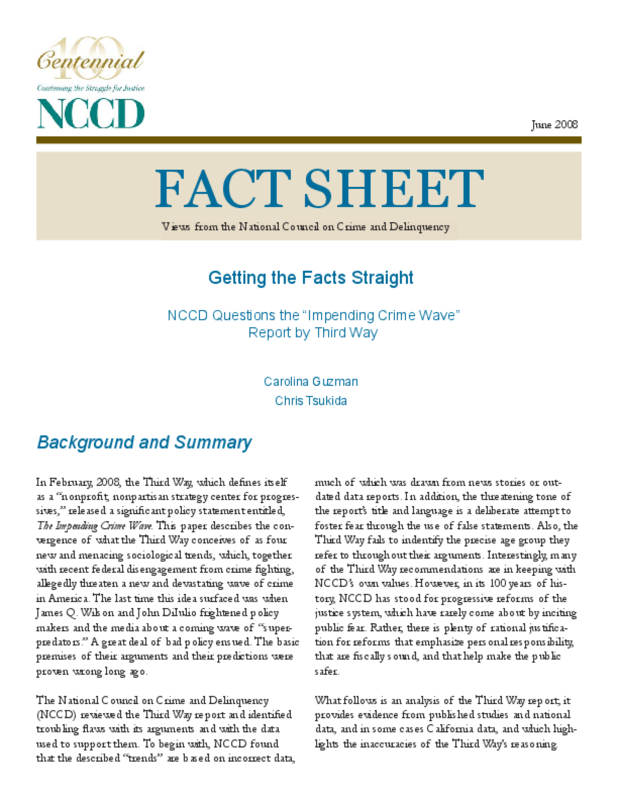 The National Council on Crime and Delinquency (NCCD) reviewed the Third Way report and identified troubling flaws with its arguments and with the data used to support them. To begin with, NCCD found that the described "trends" are based on incorrect data, much of which was drawn from news stories or outdated data reports. In addition, the threatening tone of the report's title and language is a deliberate attempt to foster fear through the use of false statements. Also, the Third Way fails to indentify the precise age group they refer to throughout their arguments. This is an analysis of the Third Way report; it provides evidence from published studies and national data, and in some cases California data, and which highlights the inaccuracies of the Third Way's reasoning. Copyright 2008 National Council on Crime and Delinquency. All rights reserved.